They pop up suddenly in your head and scurry around like crazy. ANTs, otherwise known as Automatic Negative Thoughts, can distort and derail your thoughts and therefore your actions. The more negative thoughts you have the more chemicals you produce that make you feel sad or stressed….which can lead to even more negative thoughts. 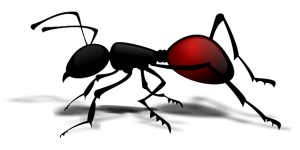 If you are suffering from a lot of ANTs, you are unlikely to be able to move forwards with enthusiasm or ease, they can really hold you back. They can be sneaky too – they appear without warning, and seem so plausible at the time that it’s hard to argue against them. BUT you can, and you must. Ridding yourself of ANTs makes your head a much nicer (and more productive!) place. The first thing to do is acknowledge some of the ANTs you have; You may find thoughts that include “I’ll never be able to…” “I always do badly at….” “Everyone else is better than me at….” “It will never work…..” Write them down to get them out of your head and help you look at them in more detail. Then acknowledge the affect they have on you; What is this ANT costing you in terms of work, life, happiness, productivity, relationships with others? So what if it does happen? What other ways can I look at this? What would I do/ could I achieve if I didn’t have this thought? What can I say to myself each time these thoughts come to me? How can I reward myself for zapping them away? I hope your bug control goes well! Keep working at it and you will find you have less and less ANTs to deal with, helping you to feel both happier and more productive.